Relax and smell the colors! 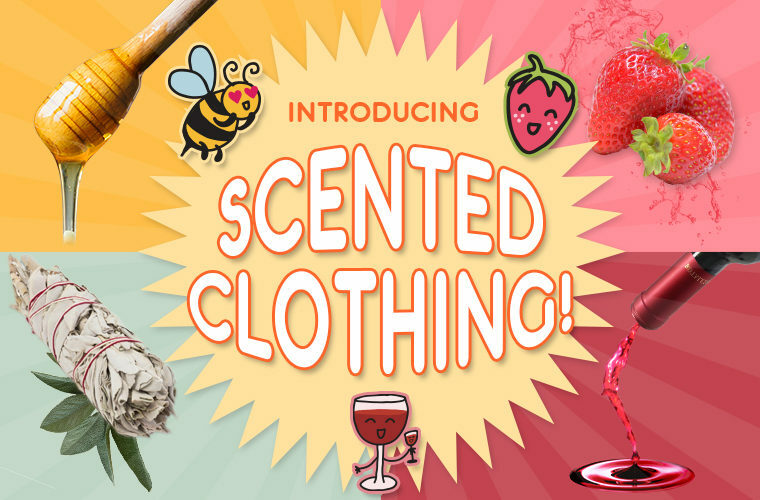 Introducing our scented clothing – inspired by all of your favorite smells. Yes, Soul Flower clothes are still all eco-friendly and locally made, but now you can carry the essence of honeycomb, cabernet wine, or sage bundles with you all day long! Whether for holiday, birthday, or just good vibes, we want to help you pick some special, unique items for those free spirits in your life. 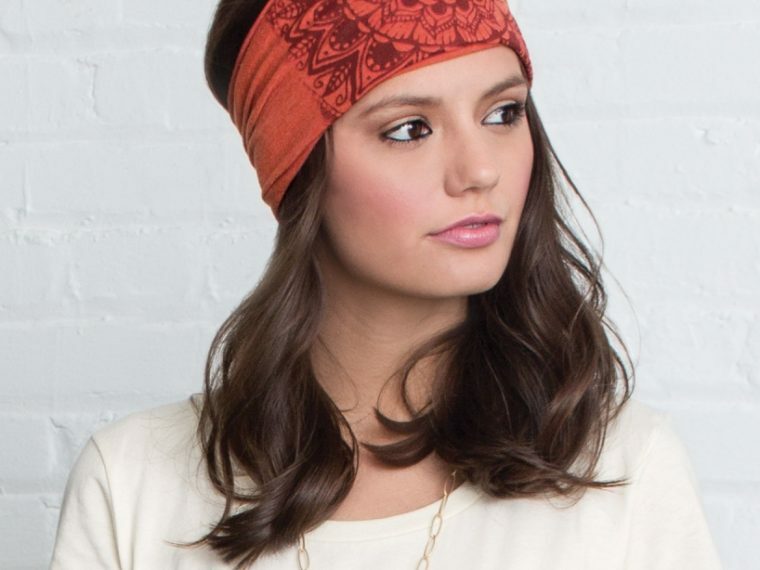 Are you are shopping for someone with true boho chic style? Looking for trends? 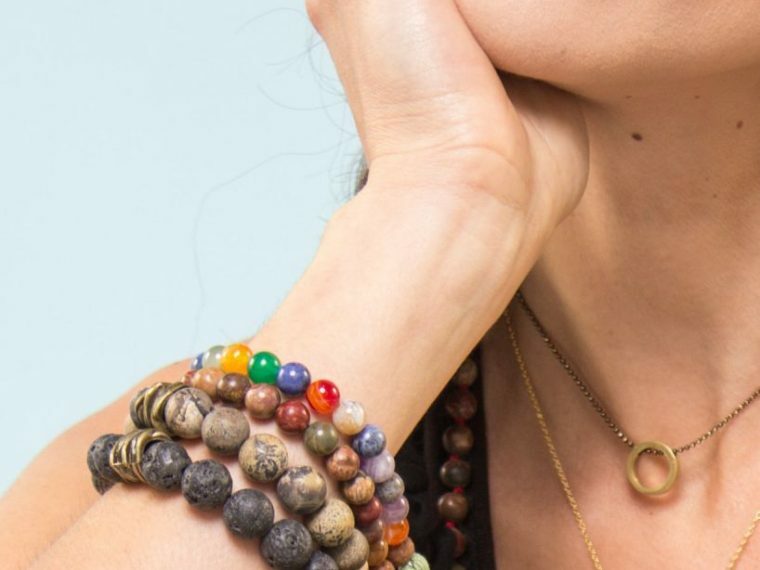 Or looking for a cute treasure to add to your boho jewelry collection? Or just need some hippie vibes to help spread holiday cheer? 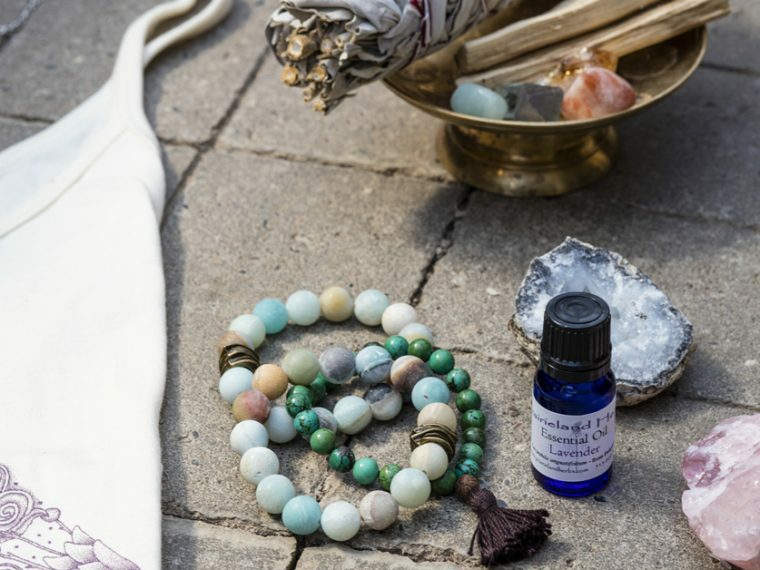 Find our ultimate gift guide here: 10 awesomely amazing gifts for free spirits below and a few bonus tips to keep your hippy holidays festive, eco-friendly and full of (free) spirit! Are you looking for unique, hand-crafted organic baby gift ideas? 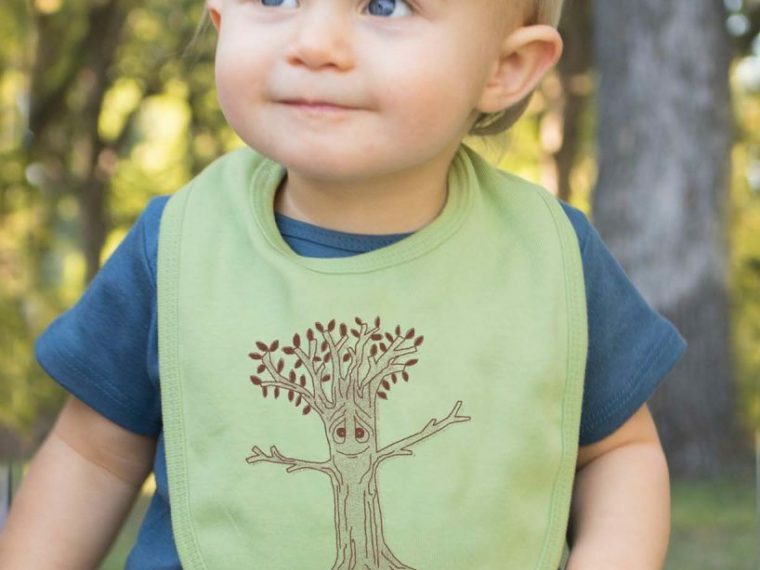 We create fun organic items for babys and with Mother Earth in mind. 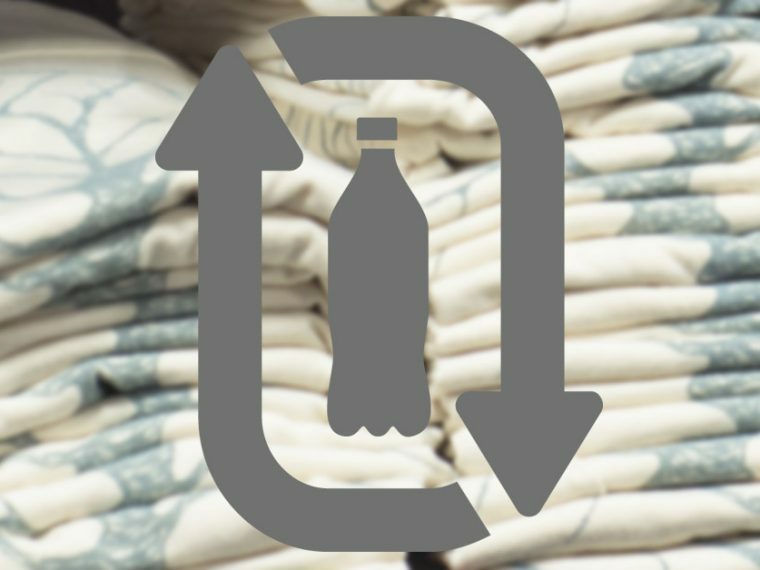 We make our baby clothing with sustainable and organic materials always, and the bulk of it right here in the USA. So whether you need a gift for that hippie mama who wants only the best organic products for her baby, or that eco-dad with sustainability and nature in mind, look no further. We have you, and your eco baby, covered! This season, we are introducing our Multiwear Skirt, a convertible skirt that converts from a skirt to a dress to a top and features an optional foldover waist.There’s something amazing about a piece of clothing that is versitile enough you can wear it in more than one way. 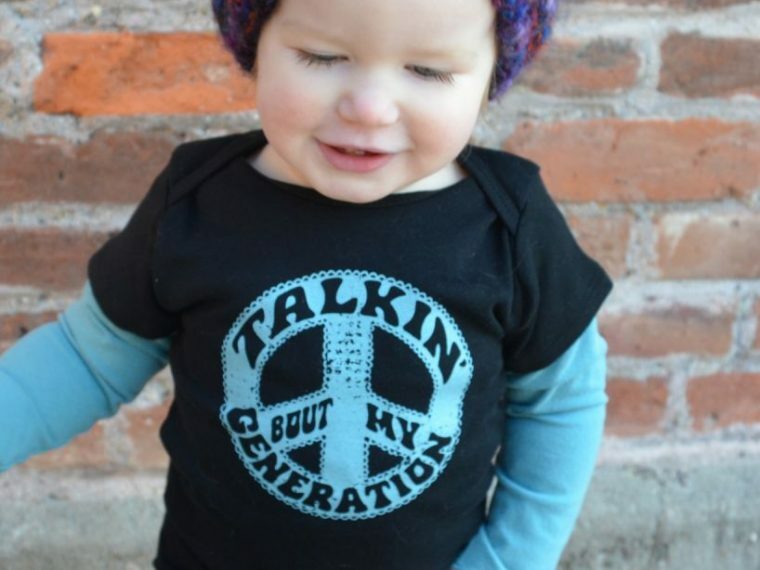 Plus, it is also made from super soft organic cotton and is Fair Trade Certified! 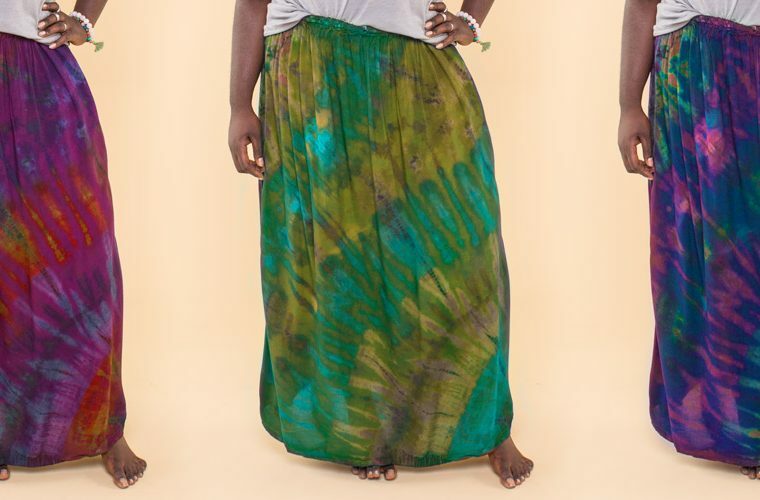 Check out our convertible skirt in its many forms (burgundy, indigo, black, printed or blank)…. but hurry because it is going fast! Are you looking for unique, hand-crafted peace sign gifts for that peaceful soul in your life? Here at Soul Flower, we create funky organic items and eco-friendly clothing with a message of Peace and Love always! We use sustainable and organic materials in all of our products. We hope we can help you find the perfect peace sign gifts! 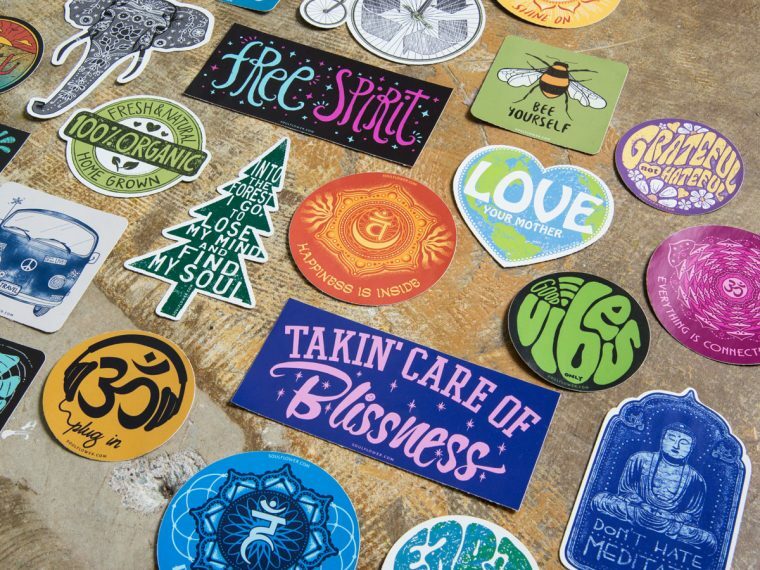 In the words of Jimi Hendrix, “When the power of Love overcomes the love of power, the world will know peace.” Keep spreading the peaceful vibes buds and take a look at some of our favorite Soul Flower products that feature a peace symbol or help spread a message of peace! Introducing our very own Flower Sprouting Tees: water your t-shirt and watch your very own wild flowers grow – right on your shirt! Of all the retailers scrambling for your attention this holiday shopping season, who do you feel good about buying from? 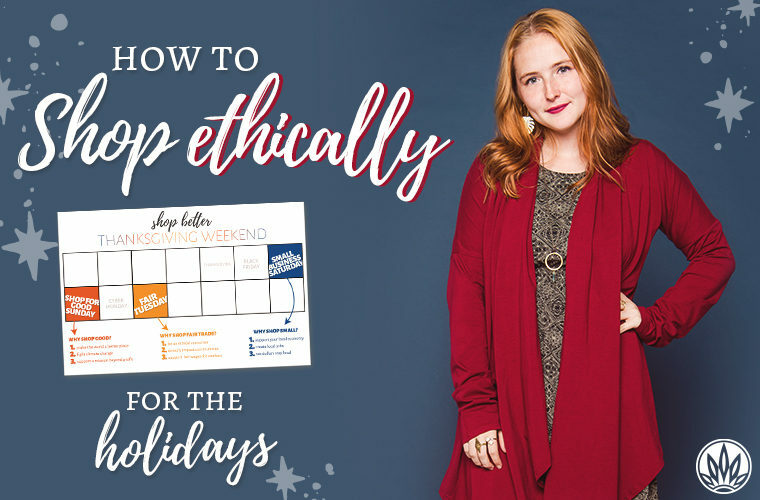 What if this year, you aligned your gift-buying with your values– by supporting socially responsible and sustainable brands (like ethical clothing brands) that have a mission beyond profit. 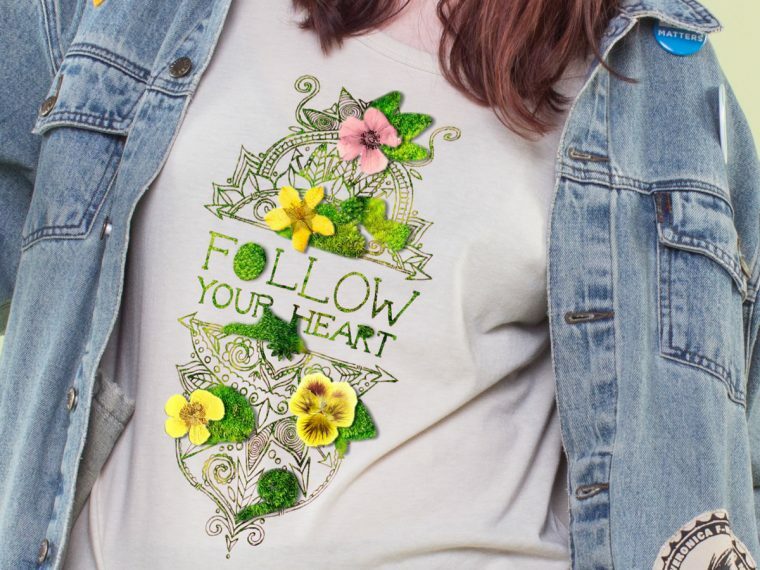 By purchasing ethically made clothing like Soul Flower you are showing you care about the planet by spending your money in a way that matters! 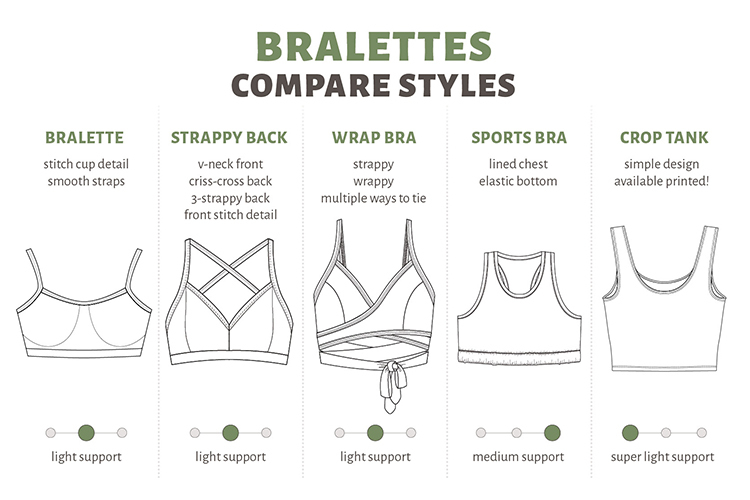 Which is the Best Bralette for Me? Our organic cotton bralettes are the best bralettes! Really, they are some of our bestsellers in the shop and they are so comfy. No underwires. No metal adjustments. Just simple organic cotton bra goodness! We have multiple styles and they’re all comfy and versatile – if you’re wondering what’s best bralette for you… read on. Happy Daze Collection: New, Organic & Fair Trade! We’re happy to introduce the latest Organic and Fair Trade addition to our web site: the Happy Daze Collection! This mini line was inspired by retro 1960s and 70s textiles: floral crochet, patchwork blankets, and bold mod prints. C’mon, get happy! Are you looking for unique, hand-crafted gifts for a tree lover in your life? Here at Soul Flower, we create funky organic items and eco-friendly clothing with Mother Earth in mind. We use sustainable and organic materials always. 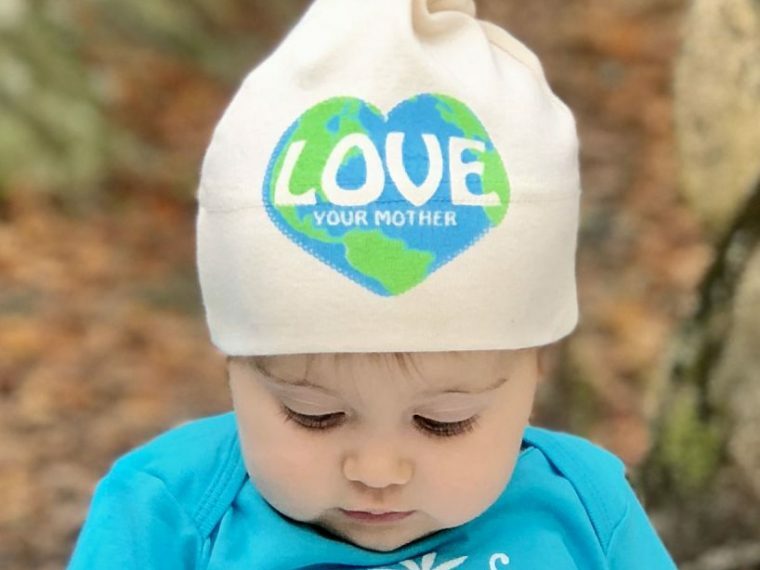 And we cater to tree-hugging earth lovers … so if you are searching the internet for a crunchy, organic baby gift for a that new natural mama… or looking to find a nature lover’s t-shirt for that relative who would just rather be camping… we’ve got you covered! We will help you find perfect eco-friendly gifts for tree lovers in your life. Take a look at our top tree themed gifts from Soul Flower and some of our other favorite sites. One-of-a-Kind threads for the One-of-a-Kind you! Hey Buds! In our shop, we carry a variety of eco-friendly, organic, and fair trade clothing items and accessories. And you’ll notice that some of these items are marked “Each One Unique”. This means that every individual product is different from the next. Cool, right?! Here are FIVE insane reasons why owning our unique threads are not only awesome but even more eco than you might think!! Elephants are a symbol of great strength, gentleness and knowledge. They are among the most intelligent of creatures on our planet! Here at Soul Flower, we often look at elephants as a source of inspiration in our designs, our artwork and for the gifts we carry in our online shop. The elephant theme runs throughout our elephant clothing collection and jewelry line. Take a look at some clothing and gifts for elephant lovers – and that will remind elephant lovers everywhere to stay STRONG and KIND always. Festival season is not over Buds! So when the beautiful Anita graced our studio last month we had her try some of our fave plus size festie looks. Athleisure Clothing: Make It Ethical! If you haven’t heard of “athleisure clothing,” you probably still know what it is. Athleisure Clothing = athletics + leisure. Athleisure clothing is athletic wear mixed with loungewear. Ya know, leggings and a yoga t-shirt or yoga pants with a hoody. Comfy stuff! Hey Buds, We want to share this adorable boutique with you that we have been working with – it is Moxie Fair Trade and they are located on the Oregon Coast in Seaside. 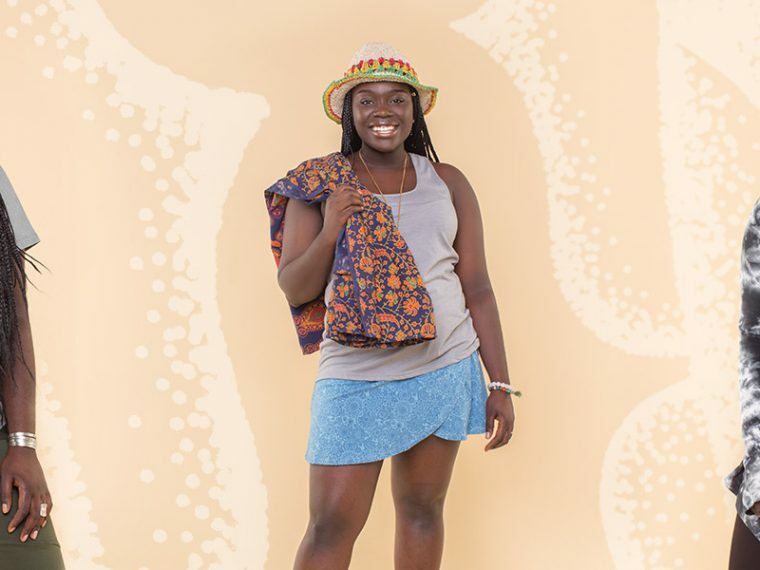 This unique Fair Trade boutique is full of fair trade or made in the USA items. And they carry Soul Flower clothing! 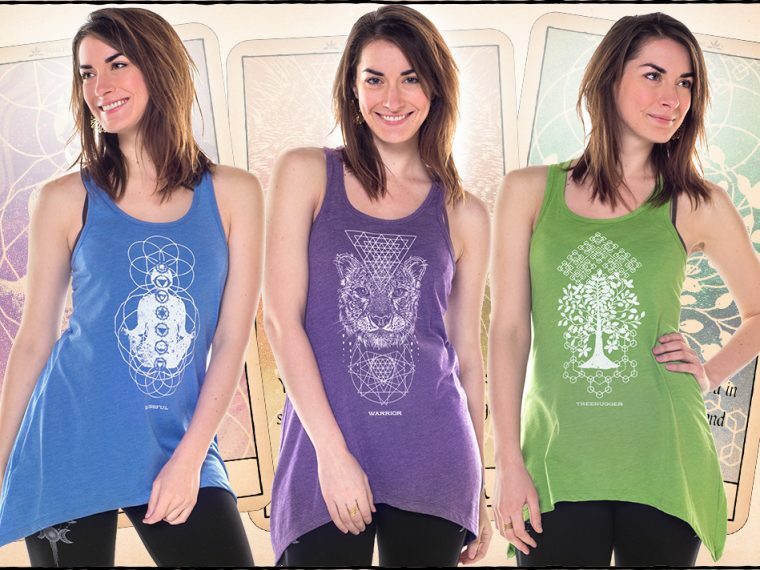 Are you looking for yoga t-shirts to help inspire your practice? 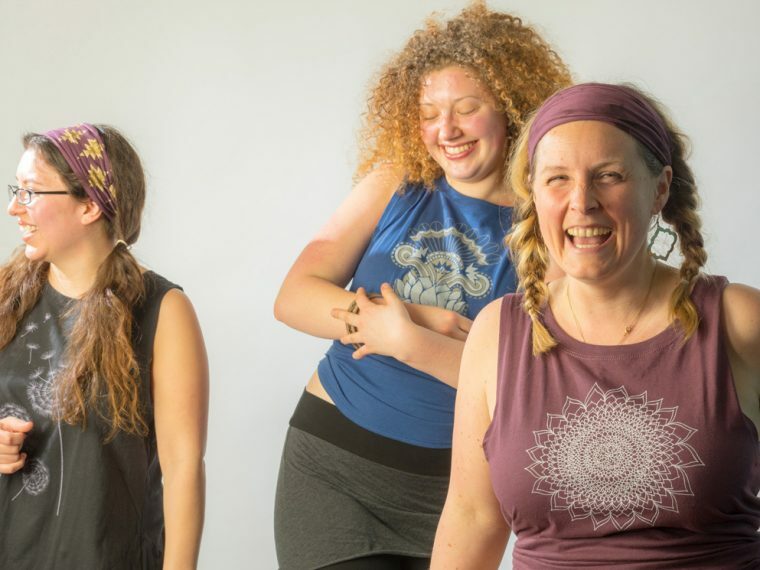 Here at Soul Flower, we add a little fun and lightheartedness to our yoga shirt designs to keep you smiling and spreading good vibes wherever you go. Check out some of our yoga shirts and yoga tanks with sayings – and as always, keep smilin’ buds! Our new Fair Trade certified, limited edition collection – Rhythm and Blues – has landed in the shop and we couldn’t be more jazzed. We’re kicking off Earth Month by adding a new icon to our Eco Guide – the handy section of our website where we tell you all about our mindfully-made products. 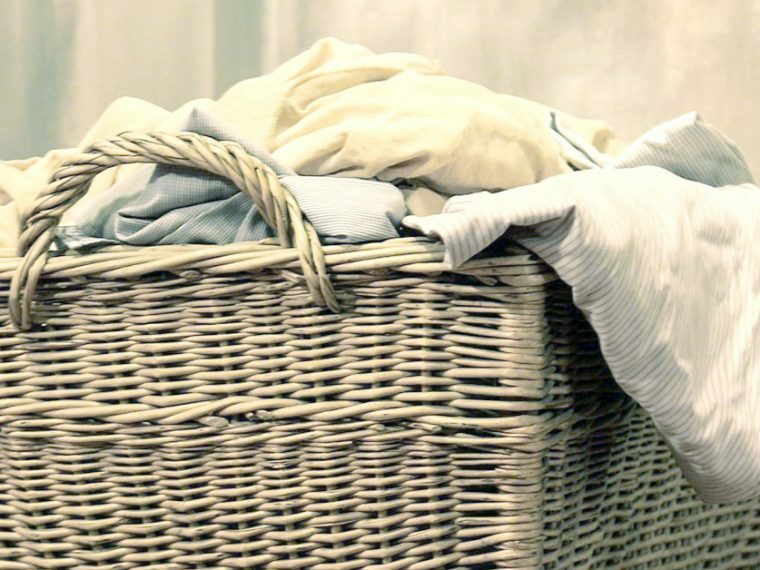 Tired of wearing the same threads, doing laundry and being eco-conscious? The tarot line. 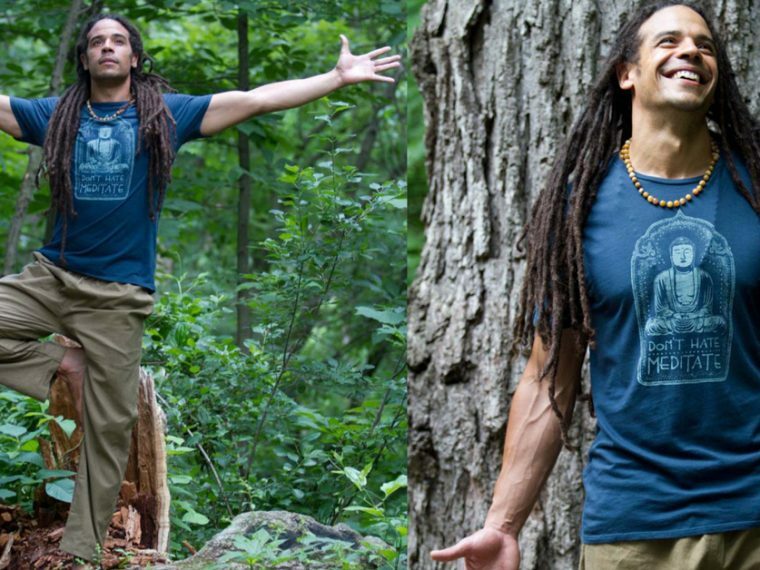 Blissful, Warrior, or Treehugger: which are you? Three sharkbite tanks, each with a different vibe. They’re not traditional tarot symbols, but if the imagery speaks to you, let it offer inspiration and guidance! Nearly a year in the making, the design elements in this mini collection of screenprinted shark bite tank tops go way back. Like early-2000s-way-back.